Stevia sweetener is a natural sugar alternative that can also replace sweeteners like Splenda, Sweet n Low, Equal, and even cane sugar. The sweetleaf starts off as a plant. Stevia's health benefits include being a non-toxic, zero glycemic index, zero calorie sweetener that's good for diabetes or to sweeten tea, coffee, pie or cake. You can sweeten anything you like with stevia. When it comes to the Anti Candida Diet stevia sweetener may be the answer we're all searching for to fight off those chocolate cravings. A fungus infection leaves little to choose from in the area of sweets. Even the slightest indulgence in your favorite dessert can cause a flare up if you haven't completely finished a yeast free diet in its entirety. People who suffer from a vaginal yeast infection, male yeast infection, or for anyone who's interested in preventing yeast infections adding this sweetener to an everyday diet can do wonders to calm a sweet tooth or cravings for artificial sugar, white, or brown sugar. What's so different about stevia compared to regular sugar? Stevia has health benefits such as helping stop sweet food cravings. This is a good side effect which leads to weight loss. It even helps prevent gum disease, tooth decay, and may even contribute to staying flu or cold free. It can be used to regulate blood sugar for people with blood sugar problems, diabetes, and hypoglycemics. In fact, it's a recommendation for people who live in South America. With these benefits, those who are looking for alternatives to fattening table sugar can definitely find it in stevia because it is low-calorie. Unlike chemical sweeteners, stevia is safe from toxic ingredients that are inside popular artificial sweeteners like Splenda, Nutrasweet, and Equal. These artificial sweeteners have been reported as causing symptoms such as headaches, muscle pain, seizures, weight gain, fatigue, rashes and many other side effects. The reason these artificial sweeteners are so toxic is because they contain harmful chemicals like aspartame and sucralose. When we eat these substances our bodies do not metabolize them properly and they can even form formaldehyde causing permanent damage to our immune and neurological systems. For people with diabetes, stevia can mean enjoyment of food without worrying about spikes in blood sugar. For more information about diabetes see this page entitled diabetic cookbook. Although stevia is a good substitute for sugar, as a rule of thumb, try not to overuse. I know how tempting it can become to use stevia in the same fashion as everyday table sugar but it's important to monitor the usage so you don't become too dependent on it. Stevia sweetener (technically termed stevia rebaudiana) packs a powerful punch. The sweet leaf can be up to 300 times more sweet than sugar. So, a little bit goes a long way. extract contains the most health benefits and is made from heating the stevia leaf in water. is white in color and made from the processed stevia leaf. was originally harvested in South America where it has been used by the Native Indians there for centuries. Today it is widely used in Japan and Brazil. Both the powder and liquid forms derive from the stevia leaf. Stevia has been used for years without any report of negative side effects. There has been numerous studies on rats in an attempt to gather information on whether stevia sweetener is appropriate for human consumption. Most of the studies concluded that more studies would need to take place for a definitive answer. Another topic at hand involves stevia being used as a contraceptive method. It was thought that in high enough doses stevia could induce infertility. To date, none of the studies done have presented any real concern. Common consciences says stevia can be used daily with out worry. 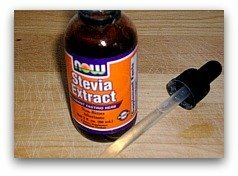 Before 2008, the U.S. Food and Drug Administration (FDA) did everything in its power to let stevia manufacturers know that it was not welcome in the United States. Many people believe the FDA's resistance to approving stevia sweetener is due to pressure from powerful companies such as Coca-Cola. Sugar is a very big money making commodity so to discontinue its use for another substance such as stevia could be devastating financially. In 2008, the FDA finally agreed not to contest stevia's use as a sweetener but would not officially grant approval.